"Never Think About SEO, Backlinks, PPC or Fighting For The Top Spot On Google Again!... 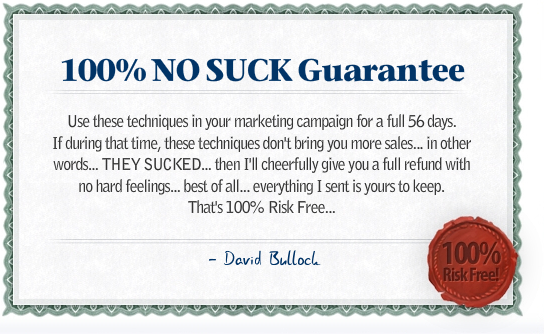 100% Guaranteed!" Think about what you have to do to build up a nice income online with Google. B. Pay out the wazoo to get good traffic from the almighty Google. Spend several hours doing keyword research...managing your visitors, learn new techniques to stay on top AND for some of you, still work a full time J.O.B.! "Google Is A Pain In The A$$!" So, what is this plan about? You see, an EMAIL list has leverage, right? We all know that. But do you KNOW many ways you can leverage it? On top of that, do you know all the ways that you can leverage it to GROW? A Money Tree...It Grows Itself!" But the problem is, most don't know how to do it right! ...How to drive traffic that doesn't require anything from the Search Engines...nothing, nada, zip! ...How to GROW your list by USING your list! I have 22 unique ways to do this...you will be shocked! This is about leverage, and how you can quickly grow a list using the list and other free traffic techniques! I've bought other list building guides and truth be told they were nothing new, in fact some of them were just plain boring. This is great though, something I can definitely work with. For $7 Rob has waaaaaaayyyyyyyyy over-delivered. I've subscribed to his future WSO's via WarriorPlus. Nuff said. "ANYONE Should Stop and Listen..."
Thanks for the previous WSO and looking forward to seeing this one too..